Tweaking a bit here and there can sometimes make all the difference. Those small improvements and adjustments can lead to bigger and better things for you and your health. With that in mind, how about improving a room you enter every day – your bathroom. Those showers, those baths can add to your toxicity level in several ways. It is true that some of those bottles, bars, jars, sprays and lotions, and even your bathroom decor could be adding to your toxic load without you even realizing it. Why turn a good thing (taking a shower or bath) into a bad thing (increasing your chemical load)? There are a few simple ways you can adopt to avoid doing just that. We certainly can’t control everything we come in contact with living in our world today, but we can try to lessen it where we can. So, let’s open the door to your bathroom and take a closer look, but first let’s check your shopping bag . . . The process of clearing your bathroom of potentially harmful toxins begins long before you even step into your bathroom. First, you need to check your shopping cart. When purchasing shower and bath products, read the labels. Buy products with USDA Organic seals or products that at least have an ingredient list with words you don’t stumble over. Here is a short list of ingredients (but not an exhaustive one) to avoid when purchasing bath and shower items and here is how to check on the toxic levels of products you already have. Same of these ingredients are not so bad by themselves but some break down the skin’s moisture barrier allowing for more penetration of the other harmful chemicals. Dioxane: Common in a wide range of products as part of PEG, Polysorbates, Laureth, and ethoxylated alcohols. 1. LOOKS ARE NOT EVERYTHING. That darling shower curtain and no slip bath mat may have other designs besides prettying up your bathroom. Some of them contain harsh chemicals that when heated up in the shower or bath could contribute to respiratory irritation; damage to the central nervous system, liver and kidneys; nausea; headaches and more. You don’t want to take that chance with you and your children. That strong “new shower curtain smell” that accompanies PVC vinyl shower curtains and shower curtain liners is a warning to consider replacing those plastic items with a cloth curtain and 100 percent rubber mat. Don’t miss this: Here are some simple switches to reduce the other harmful types of plastic in your everyday life, too. 2. DON’T ALWAYS GO HEAVY DUTY. Most of the time, those hefty chemicals like bleach are not necessary. Steam cleaners that use only water can be a great option and there are so many non-toxic organic brands of cleaners that can be found on the market as well. 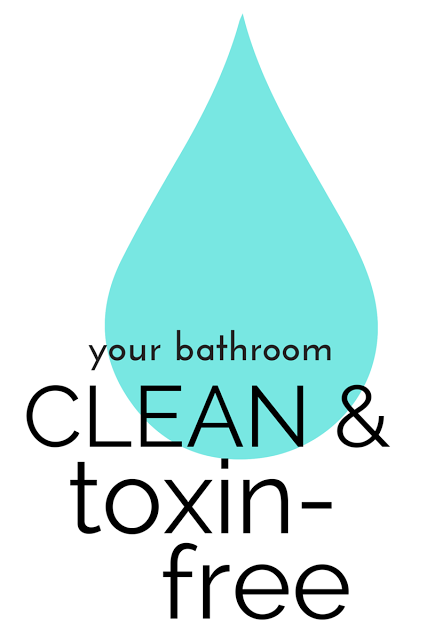 Don’t miss this: For those deep cleaning bathroom jobs, here are many suggestions on how to thoroughly clean your bathroom without toxic chemicals or cleaners. 3. BRUSH YOUR WAY TO SMOOTHER SKIN. Most everyone wants smoother, softer skin, but there is no need for chemicals contained in so many skin products to do it. Try this dry brushing technique that only takes minutes a few times a week as a great step to take to do just that. Another way to gently and safely remove dead skin cells is with baking soda. It is incredibly inexpensive and makes a great exfoliant. I keep a small container of baking soda in my shower and use it daily by mixing a bit of it with my facial soap. And, by the way, so does Emma Stone and Giada De Laurentiis (discussed here). And, last time I checked their skin looked pretty good! Don’t miss this: I have loads of great pins here to help you take natural care of your skin easily and beautifully. 4. DIG UP SOME DIRT. Keeping a nail brush in your shower is a good reminder to clean those hands and under your nails regularly. So much bacteria can collect under your nails that could lead to infection. Just make sure you sanitize your brush regularly and let it air dry. Don’t miss this: Effortlessly clean all your brushes (toothbrush, make-up, etc.) in five minutes or less. 5. PEEK IN YOUR PANTRY. Your pantry is stocked with cooking oils like coconut oil and olive oil that make great moisturizers after the shower or even as a remedy for dry hair. And, they contain zero chemicals to get the job done. I personally use both just like this lady here that lived to 122! Don’t miss this: It doesn’t have to summer time to reap great benefits from these natural 2-ingredient hair masks to bring your hair back to life. Depending on where you live, your shower water could be spraying a lot of chlorine and other harmful chemicals all over you. Test your water to see what chemicals you may want to avoid and purchase a shower filter that can be attached to your shower head. 7. ALLOW THE AIR IN. It is such a simple measure to remember to open your windows and leave your fan on as you shower and leave it on for about 30 – 60 minutes after the bath or shower as well to aid in reducing the moisture levels that attract the mold and mildew to form. An extra bonus is less cleaning will be required, too, and no harsh chemicals to rid your bathroom of the mold! To a tidy person, it may seem obvious, but to one that is not, you may have to nag on this one: hang up all towels after use to allow as much surface area as possible. And, don’t throw a damp towel on the floor or in a hamper to dry. The bacteria builds up much more there as it doesn’t dry completely between uses. Damp towels attract bacterial growth, which causes that musty smell indicating bacteria is growing. Yuck! Wash your bath towels after about three uses, according to the pros. And, those facial towels should only be used once to prevent breakouts and bacteria exchange. Don’t miss this: Those kitchen towels require certain care, too, and they can do way more than wipe up spills. Do you have any favorite natural products to share that you use when showering or bathing? 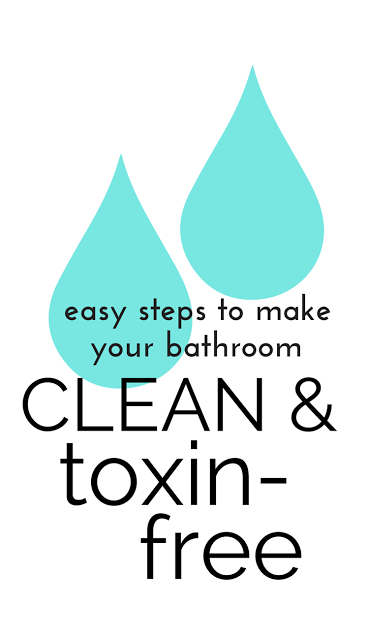 Any special methods of cleaning your bathroom toxin-free? Please add in the commentS. See what this guru has to say on clean eating. Here are a few productivity tools to help you free up some time. Keep to the natural stuff to clean them as much as possible, Jenny. Not a fun task, but so necessary! Good to see you here! I completely agree with you! I jumped on the "no pooing" board and only use baking soda and essential oils to wash my hair. Have you tried it? I have not! Please do come back and let us know a bit more in the comments if you have time, Danielle. Lot of great info here. Love this article. Thank you for sharing with us @ #HomeMattersParty. We would love to have you again next week. Kind of you to say so! Thanks for connecting, Sahana. That plastic smell is so strong and offensive and I can tell you I think it was giving me headaches when we had one long ago in college as every time I got out of the shower, I had one. I have found cloth liners very inexpensively at places like Home Goods, etc. And, good for you, keep that window open, Launna. So gad you added in here! Very kind of you to say so, Kathleen! Wow this is so eye-opening…so many things to consider that are lurking in the bathroom! Great article that I'm pinning! So happy to hear it helped you, Janelle. All pretty easy to do and these little measures can make a big difference. Tori- thanks so much! I am very happy to hear it was helpful for you. And, thanks for taking the time to tell me!